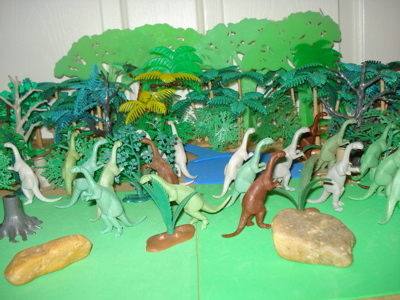 Watch a Dinosaur movie or check out the Dinosaur toys. 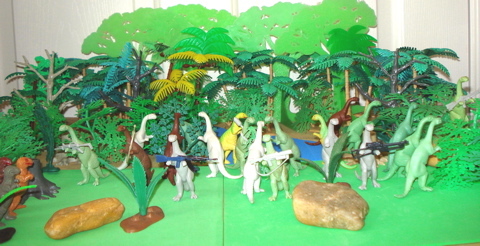 I have always thought of the 1955 Marx Plateosaurus as one of the great natural victims of the Dinosaur toys universe. 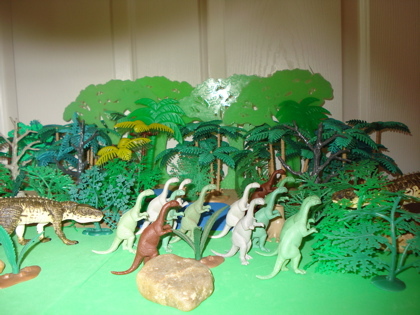 It was small (1/86 scale) and therefore quite defenseless when facing the myriad predators it had to deal with. Even the relatively overweight (and perhaps slow) Pot Belly T-Rex and Allosaurus of its own generation certainly had it "outgunned" and with 1959 and the emergence of the new, "revised", "sleek" T-Rex it was sorely pressed. 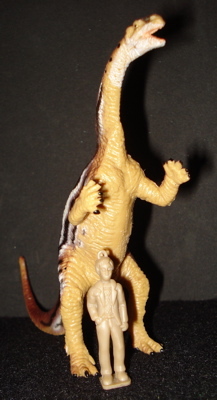 Today we explored the world of the Carnegie Plateosaurus, originally issued in 1994 and remodeled in 1996 this member of the Dinosaur toys family is currently out-of-production but still available on the web and in stores. 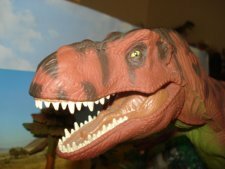 It is a well made, detailed and very nicely, excitingly painted figure that is "realistic" even given today's Dino-toy standards. I like the figure. I hadn't owned any and needed these for today's page, only receiving them last week. 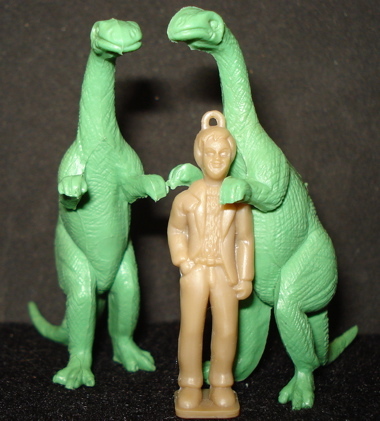 My wonderful wife, DinoWoman (married name DinoWife) thinks they are adorable. I must admit that they are expressive and exude attitude which isn't easy for a vegetarian. Their only flaws are stubby little "fingers" and small, weak looking thighs. The leg problem is somewhat camouflaged by the great paint-job but nothing can hide those hands. Rexford was a bit under the weather (which incidentally promises our first real snow here for tomorrow, maybe some fun in the snow pix are on the way) today. 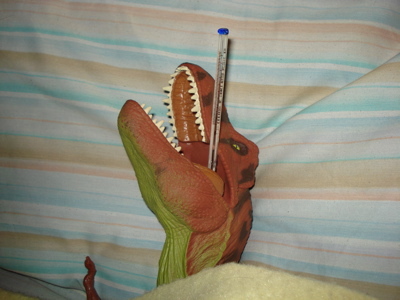 We took his temperature but that didn't work out too well as he just can't keep his mouth shut long enough. 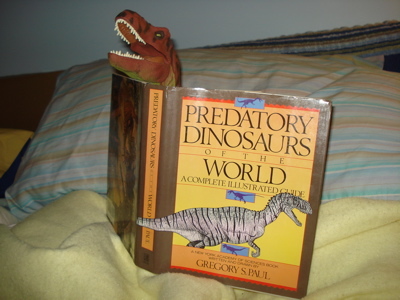 He passed his time reading about himself and his relatives but we were worried about Rexford as he appeared to be a bit lackadaisical. "I'll get you for this!! This is just humiliating...."
Hmmm. 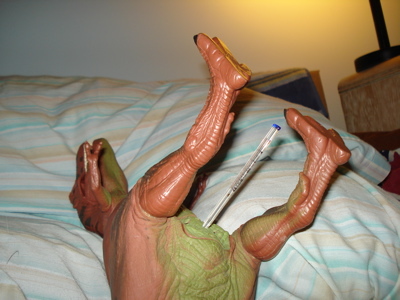 Still no Dinosaur movie. 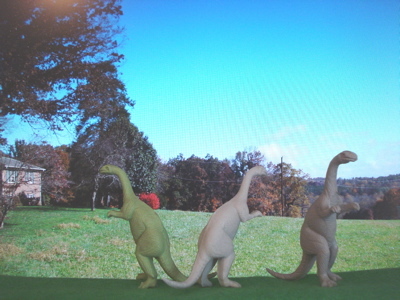 We hope that the mis-named Dinosaur movie page has kindled fond memories (far better than films). Click this link to return to our main Blog Archive page.